Just as Dorothy Cross had two professional careers, teacher and museum archaeologist, she distinguished herself in two research areas. First, while still a graduate student she was a member of the Joint Expedition of the University of Pennsylvania Museum and the American Schools of Oriental Research to Tell Billa and Tepe Gawra in northern Iraq. Cross contributed “The Pottery of Tepe Gawra” to The Excavations at Tepe Gawra published by the University of Pennsylvania in 1935. Hers was the only chapter with a by-line. Cross’ fieldwork in Iraq lead to her dissertation titled Movable Property in the Nuzi Documents, which was published as a monograph by the Oriental Society. With two major and several minor publications to her credit, Cross was an established Near Eastern archaeologist soon after finishing graduate school. Her publications considered archeological, historical, and ethnographic interrelationships, which continue to be relevant to archaeology. She spoke fluent French and Arabic, as well as read German, Assyrian, Sumerian, and Hittite. Cross’ other archeological specialty was New Jersey Indians. She was supervisor for the Indian Site Survey for New Jersey, a Work Projects Administration project from 1936 to 1938. Results from the Abbott Farm excavations near the Marsh were published in 1956 (Archaeology of New Jersey Vol 2, Abbott Farm) for which she received a national award from the Society of State and Local History. She was admired for the patience and skill with which she matched and patched broken pottery. She was also attentive to young people who were interested in local Indians and helped them understand the artifacts they found (personal reminiscence, Clyde Quin Aug. 2011). For much of her professional life Dorothy Cross divided her time between the New Jersey State Museum and teaching at Hunter College in New York City, and was deeply committed to both. She was ‘Cross’ the archaeologist and ‘Jensen’ the teacher, perhaps a way to keep her activities separate. 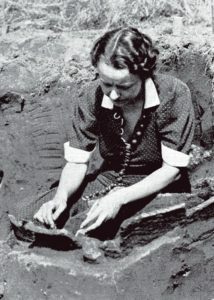 At Hunter College, where she was first employed as Instructor in 1938 eventually rising to Full Professor, she developed courses in many areas of archeology, oversaw the transition from archaeology as part of biology to its being a separate department with a strong commitment to training graduate students, and served as division chair for seven years. Despite her busy schedule, she was a fine hostess and accomplished cook. The Jensen home in Bucks County, Pennsylvania provided shelter to those in need – dig crews, friends, and relatives. As noted, Dorothy Cross made important contributions to the archaeology of New Jersey. In addition to her Indian Site Survey work (Archaeology of New Jersey Volumes 1 and 2; Cross 1941, 1956) and numerous museum exhibits, she was committed to educating the public about the importance of the state’s Native American heritage. She wrote for the general public. She also solidified the relationship between the Archaeological Society of New Jersey and the New Jersey State Museum. She was for many years New Jersey’s prehistoric archaeology expert and laid down the groundwork for valuable work in later decades. Her achievements in archaeology at the time are particularly impressive as they were made in a typically male-dominated profession. (This short biography is modified from part of a paper presented at the Annual Meeting of the Eastern States Archaeological Federation, Mt. Laurel. New Jersey. (Nov. 7-10, 2002) by Gregory D. Lattanzi, New Jersey State Museum).